The Internet of KoolThings, aka "IoKT"
What do proximity tagging, garage-door opener, BBQ-grill temperature probe, pedometer-for-TV time, streaming music via Siri/Google-voice command with sync’d flashing LED lights, GymDJ have in common? They all are wireless interconnected apps supported by the “Internet of KoolThings” platform. This project idea first came to us couple years ago when a team member’s father with Alzheimer’s wandered away and got lost. In the search for a portable alarm/notification monitoring device to help family members avoid similar incident in the future, we developed a pair of Bluetooth low energy-based wearable devices and a simple Wi-Fi/IP-based home monitoring prototype that addressed these needs. The pair of stand-alone Bluetooth low energy devices would sound their buzzers when the Alzheimer patient and his caretaker are separated beyond a preset safe range. The Wi-Fi-based prototype serves as a streaming audio-video patient monitoring platform. At about that same time, low-power sensors, cloud-based services, and particularly smartphones with their user-friendly apps were becoming more and more popular, heralding the arrival of the IoT in consumers’ households. Seeing the golden opportunity in the rising IoT trend for Smart home market, the team embarked on an even more ambitious mission to design an expandable multi-sensor, multifunction system that packs features found in many different consumer product categories into a user-friendly “iWanditAll” KoolThings platform. KickStarter demo videos and the following block diagrams highlight the system architecture and various iOS and Android “appcessories” supported by KoolThings. KoolWand (fig.2) is a wearable, futuristic magic wand that connects to smartphone apps via Bluetooth low energy to monitor and control your surroundings to simply enhance your life and make it more secure. KoolBridge (fig. 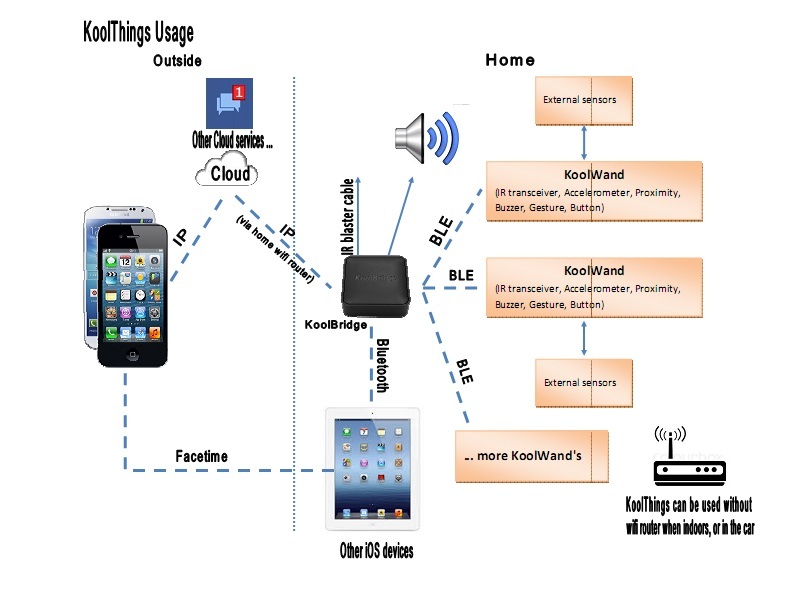 3) is a dual-purpose bridge connecting KoolWand sensors to cloud services for home monitoring as well as bridging between different wireless standards (Wi-Fi, Bluetooth, Bluetooth low energy, IR and optionally PLC and Z-Wave) for home remote control. It also supports Wi-Fi and Bluetooth audio and video streaming for surveillance and entertainment applications such as streaming your favorite songs in your tablets/smartphones, USB-flash drive, or from cloud music services to your home stereos or car sound system. KoolSensors (temperature, humidity, light, PIR-motion, BBQ-grill temperature sensors, etc.) connect to KoolWand’s microUSB port and can be monitored from a user’s cellphone over the WAN wide-area-network via KoolBridge or directly via user’s Bluetooth low energy smartphone in homes without a Wi-Fi router. KoolAccessories (fig. 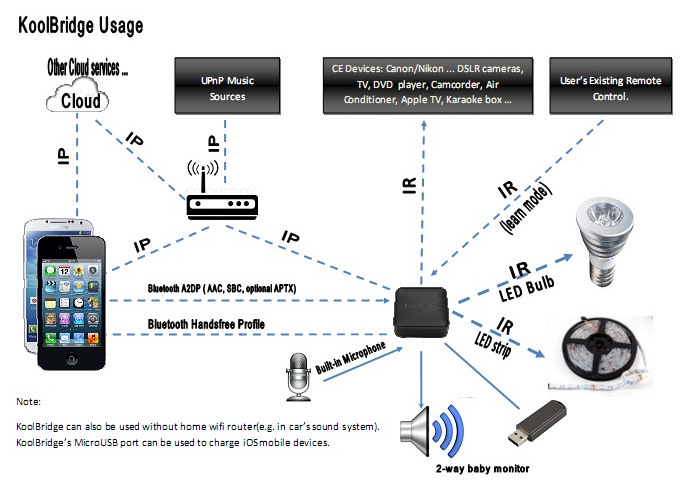 4), at present, consist of a smart-power-switch (that turns on/off any AC appliances plugged into its AC output; and is either directly controlled from smartphones through Bluetooth low energy or via Wi-Fi-based KoolBridge) and various dongles that are inserted into iOS mobile devices’ headphone audio-jack: for example, the IR remote dongle turns iOS mobile devices into universal IR infrared remote. 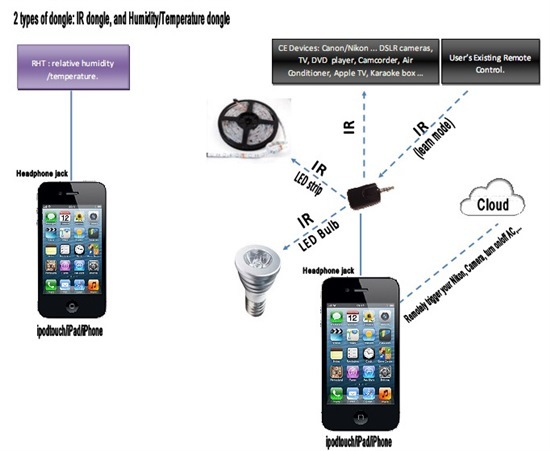 Similarly, RH/T dongle turns the iPhone/iPod/iPad into a relative humidity/temperature logging device. Working together synergistically to create a new "AutoTainment" (automation and entertainment) category of consumer product in the SmartHome, “iWanditAll” KoolThings supports additional features in personal security tagging, health/fitness/activity tracking, remote control via voice command, and automotive hands-free operation. Central in the architecture of KoolThings is the use of Bluetooth low energy both in KoolWand and KoolBridge. 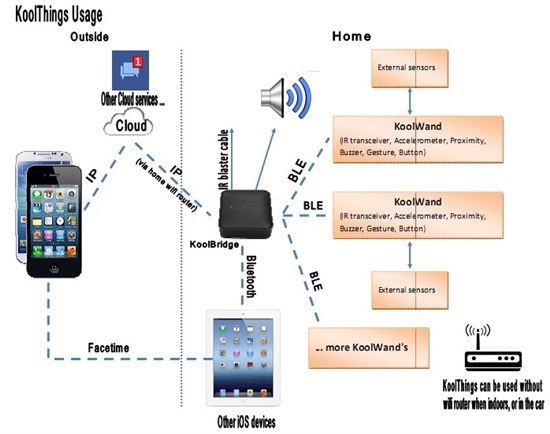 The KoolWand operates in one of three usage models depending on which Bluetooth low energy device it is connected to. 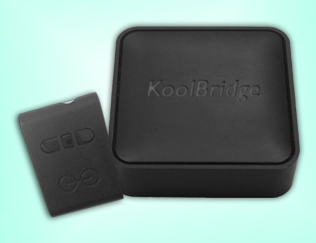 KoolBridge’s Bluetooth low energy module, on the other hand, acts as a central device that scans, discovers, and connects to peripheral KoolWand’s to monitor their sensors’ status and to take action (via “IFTTT” or “if this then that” rule) or to report it to cloud-based services. The Bluetooth low energy solution must be very low power to meet the power budget allocated for the various sensors, maximizing battery life. Efficient power and rechargeable battery management is another important consideration. Texas Instruments’ (TI’s) SimpleLink™ CC254x Bluetooth low energy wireless MCUs and TI power, battery management solution met these requirements and helped make the multi-sensor, multifunction wearable KoolWand a reality. 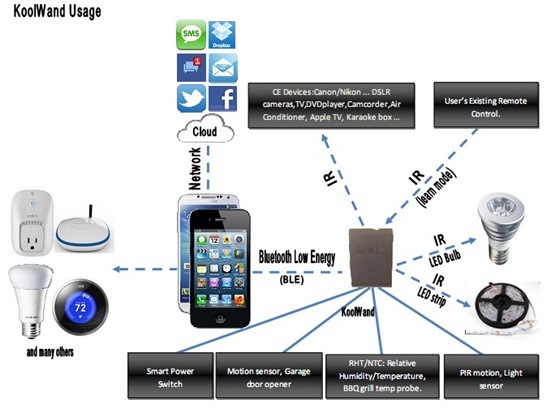 For home automation application where range is an important factor, Bluetooth low energy is at a disadvantage compared to a Wi-Fi or ZigBee mesh network. KoolBridge employs an optional RF range extender chip from TI (CC2591) to improve the covered range. Alternatively, as KoolBridge also supports wireless streaming audio feature, one can install a second KoolBridge and use it as both a range extender and second media player for a whole-house audio system.